The 2014 Trends keep in mind what difficulties are faced by suburban families and what create a wow factor otherwise. 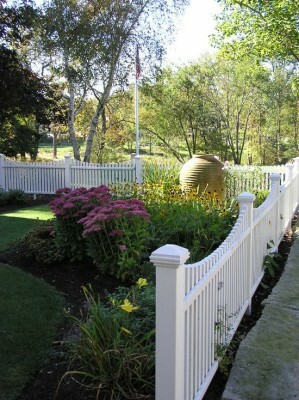 It’s often confusing what to apply as your fence paint because in this busy world everything needs to be done pre-planned because there’s not much time for seasonal remodeling. If you’re puzzled, then wrap up your fence with the trend design of coloring it with all the colors you find brilliance in. If it is shaped in a crayon-inspired manner; it could further add to the whimsical touch and playfulness. Privacy has been a major component of these 2014 trends, and would be surely a magnificent addition for you to add a contrasting panel above it. Standard lattice panels could be brilliant to add perfection to a cream colored fence or the aluminum panels with a matching cedar could complement a darker colored concrete fence. Breaking up such fence with the trendy iron window grate prevents the fence look like a stockade while providing a view to the outside. If your view outside isn’t so attractive and your more of a conserved person who doesn’t like children peeking; then hang a mirror for an attractive garden. Embellish your fence with decorations of various elements or you could even have some stored up in your basement and then change them accordingly with holidays to be marked as the unique home.